Create your own heirloom-quality pure silver jewelry at The Painted Pig with Lilly Ollo™ pure silver jewelry clay! That's right — jewelry made from what is essentially CLAY. Our silver clay is 99.9% pure silver — to give you a comparison, sterling silver is only 92.5% pure. And did we mention that it is green? No, not actually green in color, but 100% recycled, high-quality silver. So save the world and make some silver jewelry. You go girl. 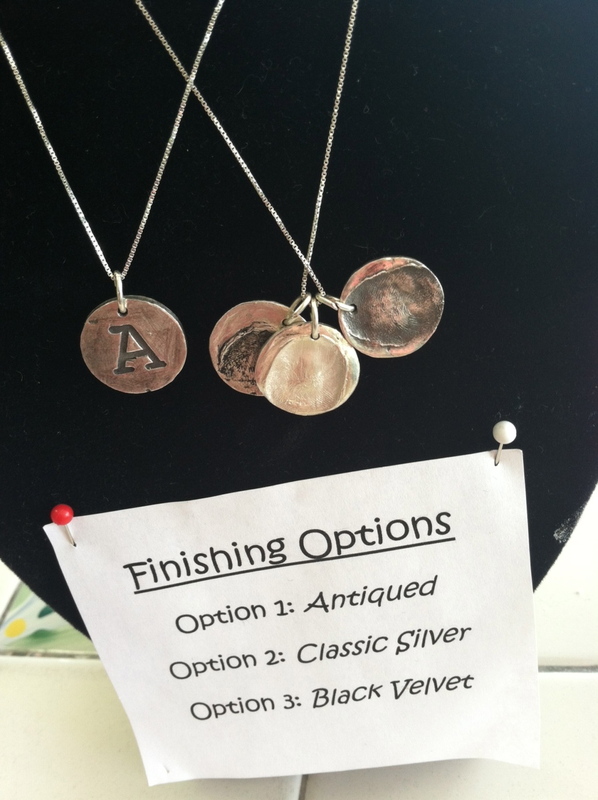 Because the silver is a moldable clay, you can customize your pieces with the hundreds of available stamps we have or even capture a loved one's fingerprint for a one-of-a-kind personalized keepsake. We will walk you through the entire process from clay to finished piece in one 3-hour session — either in one of our offered classes, or as a private appointment with friends or co-workers. We are also available to make custom charms for the busy mom on the go, just plan to spend 30 minutes to and hour with us and pick up your charms a week later. The Painted Pig also hosts bridal showers, seniors, cheerleaders, sororities, corporate events and more! We will provide everything you need to create your own fabulously artistic jewelry pieces. Front and back of a handmade, personalized silver necklace. Custom jewelry design and creation is available. Click here for info! 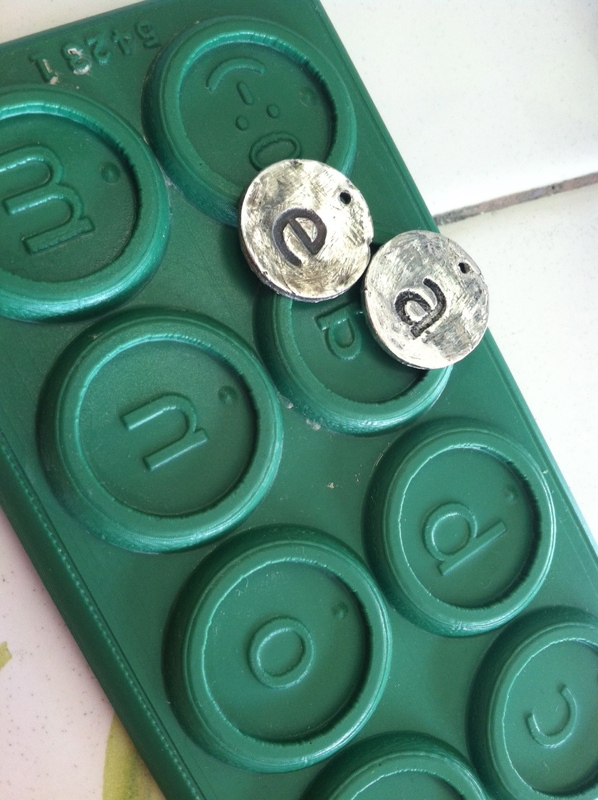 Personalize your charms with an initial on the back. Fingerprints in silver clay are a great way to capture your baby's tiny prints for a gift for mom, dad, grandparents and other loved ones. Please note that the process will be 3 hours from start to finish, including firing time. You will get to take your creation home the same day. Appointments can be anytime during the week when a Lilly Ollo Pro is available. We recommend this process for adults and children 8+ with help from an adult. Due to the popularity of our pure silver clay, please make an appointment with us to make sure clay is available. Call us at 501-280-0553 to set up an appointment today to do it your self!